The new version 3.3 of the popular instant messaging client app from SHAPE Services called IM+ has gone live! 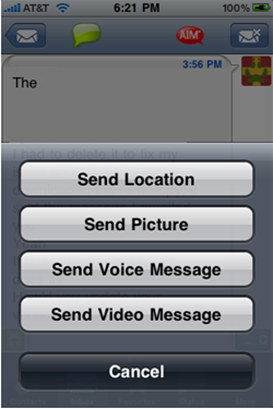 This new version brings in support for uploading and sending videos to your loved ones, much to the delight of iPhone 3GS owners! IM+ is the popular cross platform IM client with the widest support for instant messaging and social networks such as Twitter, Skype Chat, Facebook, Google Talk and Yahoo and MSN and AOL and ICQ and MySpace and Jabber etc. IM+ for iPhone also supports Push Notification feature from iPhone 3.0 and over.